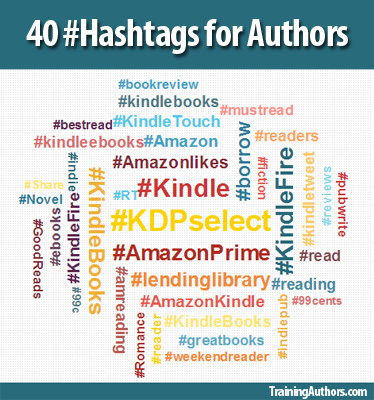 We have come up with a list of hashtags for authors from our own book marketing efforts and now we want to share this list of 40 with you. Please share any other hashtags you use in the comments below. Note: This is not an extensive list but only a few general suggestions to get you started! You probably are familiar with them by now, but if not, a hashtag is a pound symbol followed by a word or topic. For example: #hashtag, #twitter, #marketing. You can use hashtags on Twitter, Instagram and Facebook. We created this list of hashtags specifically for Twitter marketing, but feel free to try them on the other platforms as well. How Should We Use Hashtags? I usually use 2-3 hashtags with my tweets. When I add a hashtag, it then adds my tweet to that Twitter list. For example, you can see all the current tweets for #Amazon on Twitter here. This can potentially give you exposure to people outside your sphere of influence. Personally, I have found Twitter to be an amazing way to network. I have found blog hosts for my blog tours, built relationships with others in my niche, etc. However, it can be a time waster as well. Like all marketing, I recommend that you test it. Use links that you can track the clicks (i.e. ow.ly, bit.ly, pretty link, etc.) You can also create a specific Amazon affiliate tag for Twitter so that you can know how many book sales you get from your promotions there. If you find you aren’t getting many clicks/sales, then re-evaluate your efforts. One thing I try to do on Twitter is to link to my opt-in page within my Twitter profile to gain new e-mail subscribers. I also look for people related to my niche to follow to reach new people not already in my network. Try using a variety of hashtags to get on lists or improve the wording of your tweets to invite them to click and find out more. Personally, I find it to be a worthwhile part of my marketing plan but each author must evaluate that for themselves. Look forward to your newsletter. Thanks. This is a great list of hashtags. Will definitely use some of these. My husband has written 2 books and we are both unfamiliar with using hashtags. He does not have a twitter account but he has Facebook. His books are available on Kindle Books at Amazon. Would he use #kidleebooks, #Amazon, etc and include the title of his books on his posts? Would he use hashtags of words that describe the books content? Hi Shelley, Thanks for the great list of Hashtags. I’m quite new to publishing books however my books are classed as no/low content books as mostly planners,journals,colouring ,writing practice and calligraphy books. Would you know of suggestions for using hashtags for this type of book or where to research. I mainly use Facebook, but I’m starting to use Pinterest, Instagram and Twitter more. Thank you, Tracey. Is it necessary to use hashtags when writing your book? If so, when is it necessary? Does the book have to be broken down in any particular section of the writing? Hashtags help with visibility on social media platforms, esp. Twitter and Instagram. It’s definitely not necessary, but can help with marketing.